Laos Angeles Deuan Sabaidee (or LADS) is our "monthly hello" - a chance for members to get to know each other and an opportunity to come together and discuss ways to strengthen the visibility of our community. Hosted and organized by Seraphina Lotkhamnga & Somlit Inthalangsy. Deuan Sabaidee is hosted the last Thursday of the month! UPCOMING: 4/25/19, Koreatown. Please email info.laosangeles@gmail.com for address. Gin Dee is hosted every other month. LGBTQ Laos Angeles is a space provided for Laotian LGBTQ members to feel comfortable and to be seen in the larger spectrum of what it means to be Lao/Laotian American. We hope to empower and uplift the community members, provide resources to the community at large, and to dialogue about issues that affect members. We seek to advance the Laotian LGBTQ identity within the United States by promoting and amplifying the works of existing Laotian LGBTQ individuals. We hope to inspire younger LGBTQ Laotians to love themselves for who they are and to pursue whatever their hearts desire. Hosted and organized by Saengthong Douangdara & Jonathan Vorsane. Rita Phetmixay is passionate about spreading the wealth that is the importance of self-care. 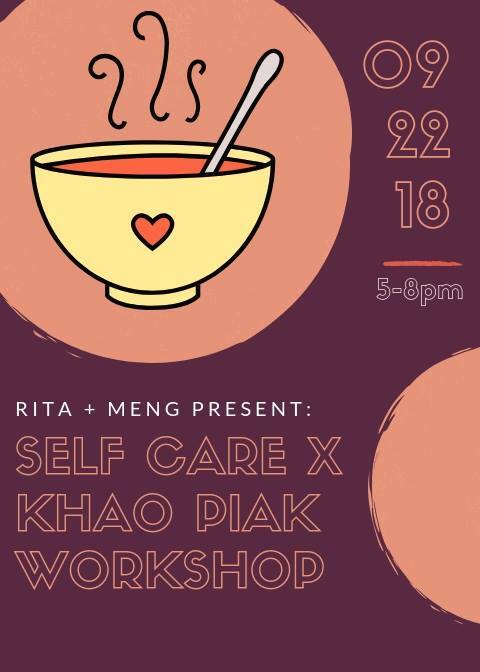 From a guided meditation to eating good food, the self-care workshop is the one to be at. Hosted and organized by Rita Phetmixay. Self care workshops are held quarterly.